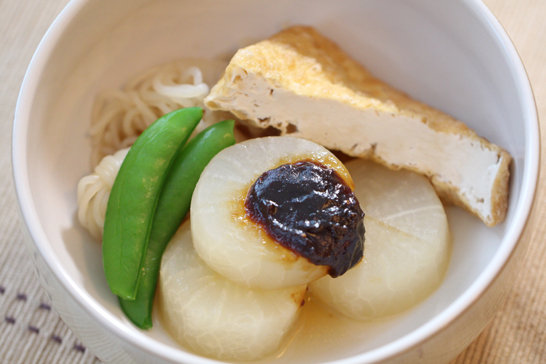 Today’s recipe is ” Shojin Ryori, Miso-Oden“. “Shojin Ryori” is Japanese vegetarian cuisine. At this time, we only used Daikon, Shirataki noodle and home-made Atsu-age. We don’t use any fish cakes or meat in Shojin style. For cooking Oden, you need some prepareing each ingredients. It takes a time a little bit but if you did, your Oden become much better! Shirataki noodle made of Konjac. It is very low calorie and High fiber. “Haccho-miso” is the one of main ingredient Nagoya areas. Enjoy its’s dark color and strong soy-beans taste. 1. Slice Daikon 2.5 cm×10 pieces. 2. Remove skin and trim the edges. 3. Simmer Daikon with water or white water. 4. When it become a little bit soft , cool with tap water. 1. Drain packed water and rinse Shirataki noodle with tap water. 3. Drain hot water with mesh bowl. 1. Cut for 2 or 4 pieces. 2. Put Atsu-age on mesh bowl and pour hot water. 1. Add all ingredients to a pan. Heat medium. 3. When it become glossy, turn off the heat. Put kombu and water in a big pan and medium heat. Add Usukuchi soy sauce and Mirin. Add prepared Daikon, Shirataki noodle, and Atsu-age and simmer for a while. Simmer until Daikon become soft enough. Shojin Ryori is Japanese buddhist cuisine. It is served at many temples in Japan. We introduce Shojin ryori as Japanese style vegetarian cuisine. We cook Shojin ryori without fish or meat. Using Kombu-dashi or dried shiitake mushroom dashi add umami. Shirataki noodle is common world wide. They are Low Calorie, No Fat, High Fiber, No cholesterol. 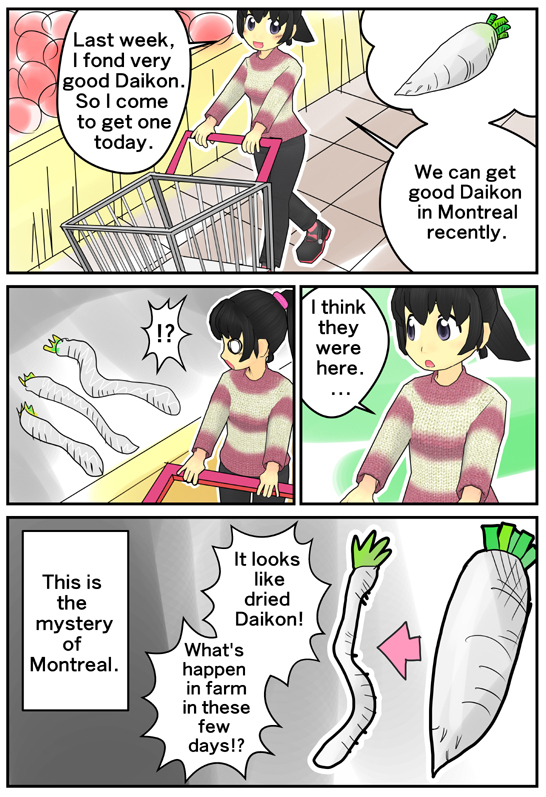 You can get Daikon at regular super markets in Montreal. You can also get Hatcho miso at Korean Japanese food store downtown. Enjoy this Japanese style vegetarian cuisine.